Summary: Clay Jensen comes home from school to find outside his front door a mysterious box with his name on it. Inside he discovers a series of cassette tapes recorded by Hannah Baker – his classmate and crush. Only, she committed suicide two weeks earlier. On the first tape, Hannah explains that there are 13 reasons why she did what she did – and Clay is one of them. If he listens, Clay will find out how he got onto the list – what he hears will change his life forever. 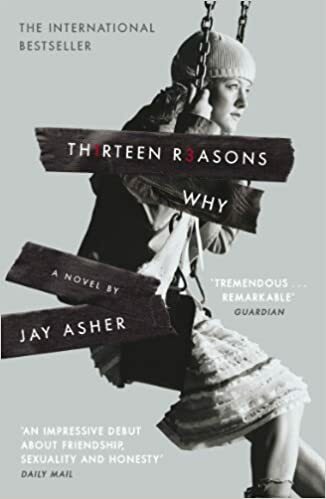 Thirteen Reasons Why is the second novel by Jay Asher that i have picked up. I enjoyed What Light, but it wasn’t my favourite YA novel of all time. I’ve actually had Thirteen Reasons Why sat on my shelf for a few years now, and the making of the Netflix series has pushed me in to reading it. I knew almost nothing of the story going in, just that one of the main characters lists thirteen reasons as to why she committed suicide. The plot didn’t overly offer many surprises from there. I did really enjoy the idea of the story, it’s told from the point of view of Clay, a boy who loved Hannah, and Hannah’s point of view from the tapes that were left behind after her death. Being told only over one night, i found it to be a unique story and a nice twist on a YA novel about mental health. Having said that, i found the story to be quite forgettable. I can’t remember many of the characters names, much of the story that was given regarding the people she was leaving these tapes to, or generally much about Hannah’s life story. All that information seemed to get lost and not stick very well. I enjoyed reading it, given the topics it was a very easy read. However i think i’m going to have to read it again to gather some information as to what it’s actually about. Clay’s characterisation for me was the highlight of this story. He has an incredible sense of hurt and longing about him which shows through in the writing very easily. A few chapters from the end of the novel, there is a scene between him and a friend in a car, and i felt everything that Clay did in that moment. I could imagine what he was going through and how that impacted his life. His personal story was told in a lot of detail, and i felt like i knew Clay a lot better by the end of the novel. I enjoyed this story, but that’s about as far as it goes. I didn’t love it, i didn’t hate it and i’m sill excited for the series to be released. I just don’t think Asher’s writing style is memorable, something that demands to be heard. It was a wonderful idea for a story, and it was executed quite well, but i can’t put my finger on what i don’t connect with.